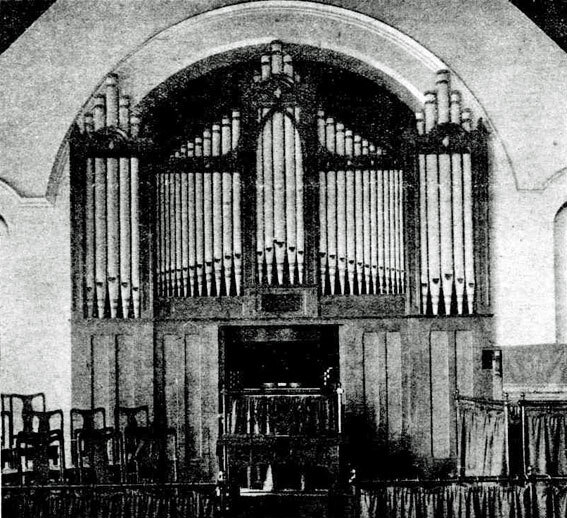 First organ: B. J.P. Eagles for his residence. Installed in church 1950. 2m., 4 or 5 rks.ext., el.mag. 2 cases against west wall, detatched stop-key console in chancel. 1m., 8 sp.st., 1c., tr. Man: 8.4.4.2-2/3.2.III. Ped: 16.8. Man: 8.8 divided.4 divided.4 divided.2 divided. B. 1887 E.F. Walcker & Cie, Ludwigsburg, Germany for "Presbyterian Church, Sydney"
1m., 2 sp. st., 1c., pedal pulldowns, tr. & tub. pn. Man: 8.8. Inst. Burwood residence before moving to pres. loc. 1m., 4 sp. st., 1c., tr. & el. Man: 8.8. Ped: 16.8. Canterbury, Victoria; purchased 1981. Rebuilt and modified 1981 - by M. Allerding. 2m., 19 sp.st., 9c., el.pn. Gt: 8.8.8.8.4.4.2-2/3.2. Sw: 8.8.4.2.III.8. Ped: 16.16.8.8.4. Installed 1940 Methodist Church, Arncliffe. Res. & inst. St John's Lutheran Church, Wollongong 1979 Brown & Arkley. 1m., 6 sp.st., 2c., tr. Man: 8.8.8.4.8. Ped: 16. B. 1951 S.T. Noad & Son. 2m., 7 sp.st., [?] c., el. pn. Gt: 8.8.4. Sw: 8.8.4. Ped: 16. Removed and installed St David's Anglican Church, Arncliffe. 3m., 15 sp.st., 9c. : el.pn. Gt: 8.4.2.II. Sw: 8.4.2.II. Ch: 8.8.4.8. Ped: 16.16.8. B. 1958 Charles Dirksen, Brisbane. Rem. c. 1969 and broken up; parts to Baptist Church, Earlwood and Ronald Sharp. 2m., 4 rks ext., el. mag. B. 1965 J.P. Eagles. 2m., 3 rks.ext., el.mag.